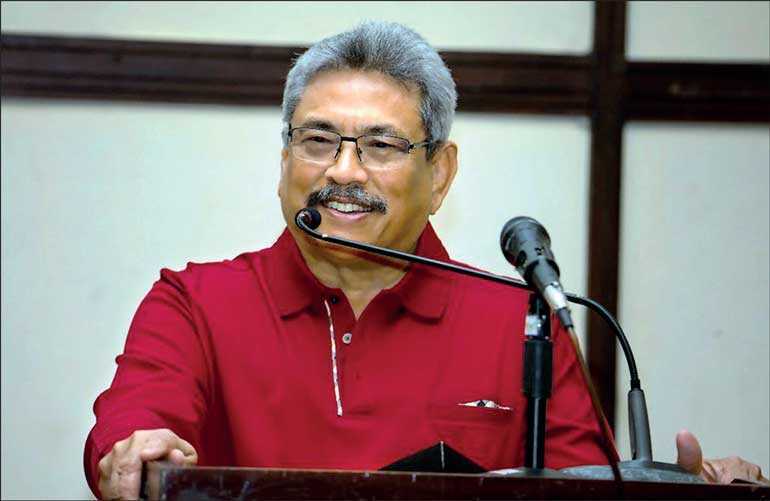 Gotabaya Rajapaksa is a determined contender for the presidency. His trenchant lecture to activists of the Viyathmaga forum demonstrated the man’s spiritedness and impulse to act. He is a driven man. What drives him? Ancient Greeks developed the concept of ‘thumos’ which they believed explained our unconscious impulses to act. It is the subconscious driving force that tells a warrior to fight. Thumos in a sense, is a synonym for passion. Gotabaya has now pronounced his passion to be president of our republic. The Greek philosopher Plato divided the soul of man in to three parts: reason, desire and thumos or the hunger for recognition). The thumos motivates the best and worst things men do. It drives them to seek glory and assert themselves aggressively for noble causes. It drives them to rage if others don’t recognise their worth. Plato observes that the thumos causes those hungry for recognition and power to unimaginable villainy over a trifle if they feel disrespected. The essential thesis of this essay is that Gotabaya Rajapaksa does not give a damn for individual human rights. His ‘thumos’ compelled him to tell us what he thinks of individual human rights. Goats are sacrificed. Not lions. Gota thinks that we are goats. Give the devil his due. It takes a special kind of intellectual honesty to indulge even in mock honesty to interrogate one’s own ideas and convictions. He was wildly applauded by the audience of professed academics and intellectuals that included the former Central Bank governor Nivard Cabraal, former Securities and Exchange Commission chairman Nalaka Godahewa and former Chairman of the SLPA Priyath Bandu Wickrema who claimed that a Singaporean diplomat told him that Hambantota will make Singapore obsolete. There is no doubt that Gotabaya Rajapaksa is convinced that his ideas are reasoned, principled positions. His captive audience of activists by their applause demonstrated that he has a resilient following bound by either conviction or are bound to his tribal identity with conviction coupled with collusion of likeminded. He stressed on the imperative of constructing a Sri Lankan identity that eclipsed ethno-religious heterogeneity. That national identity was an inclusive concept was not stressed. Obviously, the national identity of the nation state and discriminatory jingoism are sublime concepts that needed further refinement. Nearly 60% of the population remained trapped in poverty. Liberal democracy promoted by the west placed an emphasis on individual rights. Successful Asian countries pursued national objectives while we lagged behind too engrossed in individual human rights. He did not specify the Asian countries. The presidential contender opted to ignore the ideological confrontation between liberal democratic societies and the authoritarian and illiberal societies of Asia. Lee Kwan Yew attributed the remarkable economic success and stability of these Asian societies to a somewhat nebulously defined Asian values. Confucianism place a high value on family-oriented moral qualities such as filial piety and deference to authority. There is no doubt that Gotabaya Rajapaksa is convinced that his ideas are reasoned and principled positions. The captive audience of activists by their applause demonstrated the resilience of his following bound by the strong tribal identity he exudes. Individual human rights are rights enjoyed by human beings by virtue of their humanity. Such rights are inherent, inalienable, interdependent, and indivisible. They cannot be selectively granted or taken away. The enjoyment of one right affects the enjoyment of others, and they must all be respected. In China it is a different story. In China, it is the state that comes first, the collective second, and the individual the last. In situations of conflict, the collective benefit of the family or the association or the union is secondary to the state’s interest. Similarly, the individual’s personal interest is subject to the interest of the collectives and the State. This Chinese legal philosophy is not an invention of the Communist party or Mao Zedong. It has roots deep within the Confucian vision of society and the individual’s role within it. The Buddha recognised the individual. Not only is man his own master and the master of his fate and destiny, but in his capacity for attaining the highest spiritual development, that of enlightenment, man is higher than even the gods. The Buddha envisaged the world as the scene of individual human endeavour. What is man, and what should he make of his life in this world to achieve the supreme value that life affords? These are the problems which the Buddha set himself to solve and to which he found the answer. Nations and nationalism are much more than political constructions. They represent cultural phenomena that are identifiable. They include language, sentiments and symbolism. Gotabaya Rajapaksa is right. Liberal democracy has lost its sheen. Our own experiment of liberal democratic governance after the 19th Amendment is experiencing perilous times. Mahinda Rajapaksa told the constitutional council that the 19th Amendment was disastrously defective. A strident resilient segment of the polity insists on a strong decisive leadership unhampered and untamed by independent commissions to respond to identity politics and politics of resentment. Liberty, equality and individual human rights formed the core thesis of liberal democracy. Now Gotabaya Rajapaksa has told us that he is ready to be President of the Republic if we are ready to embrace his anti-thesis of an aggressive pursuit of the common good in place of universal dignity of the individual. 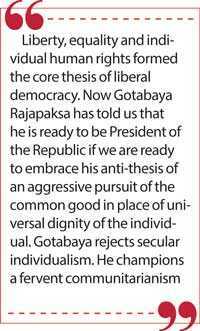 Gotabaya rejects secular individualism. He champions a fervent communitarianism. Liberal democracy despite its shortcomings of unruly protest and dissent demands adherence to some basic ground rules. In our liberal democracy that is unpalatable to Gotabaya Rajapaksa, the left leaned towards ensuring that everyone got a fair deal. The Right focused on securing individual and economic freedoms. A middle of the road movement strived for a “middle-way” until both the left, the right and those in the middle path got mired in identity politics. Identity politics has spawned zealous tribes. People no longer vote for values such as liberty and human rights but according to their identities. Sirisena violated the constitution and declared the tripitakan a national heritage. He feels absolved. Liberal democracy is not a fixed concept. It can evolve in directions that we cannot anticipate in advance. Common good and National interest offer great polemical promise. Who decides what is common good? What is national interest? Politics has made the common good and national interest so flexible that both terms are euphemisms for expediency. The answer depends on the definers and their perspectives! Both are instruments of partisan politics used to demonise opponents. There is a valid reason for us to insist on individual rights. Growing inequality in wealth and income is the principal catalyst of the conflict between individual entitlement and group demands. Gotabaya Rajapaksa did not touch on one subject. He will not talk about it because he does not wish to even consider its possibilities. He has not even heard of it. Distributive justice and settlement of social conflict are not his province. We are social animals because we cannot live exclusively independent of each other. The common good or working toward the common good is when those in the community come together and do things that benefit or are in the best interests of everyone in the community. That does not diminish the relevance of individual rights. What sort of people should we be? What does it mean to live a good life? What is the best way to live? Do we need the President of the republic to decide on them? Gotabaya Rajapaksa as president, will certainly try to do that.